Around mid-2016, when the EU’s attention was still directed at the situation in the Mediterranean, with decision makers and the public anxiously awaiting the consequences of the recently implemented EU-Turkey statement, a refugee crisis of a much smaller scale unfolded at another section of the EU border. A couple of media reports appeared indicating a possible push-back policy carried out by the Polish Border Guard at the border crossing between Belarus and Poland in Brest/Terespol.1Brown J (2016) ‘Chechen asylum seekers stranded in Belarus’, Al Jazeera English, 5 October, https://www.aljazeera.com/indepth/features/2016/09/asylum-seekers-stranded-europe-dictatorship-160919191015494.html; Deutsche Welle (2016) ‘Poland slams door on Chechnyan refugees’, 31 August, http://www.dw.com/en/poland-slams-door-on-chechnyan-refugees/a-19516827; Kurczab-Redlich K., Anannikova L (2016) ‘Czeczeni na polsko-białoruskiej granicy. Ze śladami tortur, głodni, prześladowani. Dla Polski nie są uchodźcami’, Gazeta Wyborcza, 23 September, http://wyborcza.pl/1,75398,20738464,czeczeni-na-polsko-bialoruskiej-granicy-ze-sladami-tortur.html. According to various estimates, between 1500 and 2000 asylum seekers had been stranded for months in the city of Brest on the Belarusian side of the border, undertaking multiple unsuccessful attempts to apply for asylum. The asylum seekers originated mostly from Russia’s North Caucasus republic of Chechnya, but also from Tajikistan and Syria, and many were vulnerable individuals such as children and victims of torture. In the following months, several human rights organizations, including Human Rights Watch, Polish and Belarusian NGOs, as well as the Polish Commissioner for Human Rights carried out monitoring missions to investigate the problem.2Human Constanta (2016) Invisible Refugees on Belarus Poland border; http://www.osce.org/odihr/273021?download=true; Association for Legal Intervention 2016 At the border. Report on monitoring of access to the procedure for granting international protection at border crossings in Terespol, Medyka, and Warszawa-Okęcie Airport http://interwencjaprawna.pl/en/files/at-the-border.pdf; Helsinki Foundation for Human Rights A road to nowhere. The account of a monitoring visit at the Brest-Terespol border crossing point http://www.hfhr.pl/wp-content/uploads/2016/11/A-road-to-nowhere.-The-account-of-a-monitoring-visit-at-the-Brze%C5%9B%C4%87-Terespol-border-crossing-point-FINAL.pdf; Commissioner for Human Rights 2016 Inspection of the railway border crossing in Terespol https://www.rpo.gov.pl/en/content/inspection-railway-border-crossing-terespol; Human Rights Watch 2017 Poland: Asylum Seekers Blocked at Border https://www.hrw.org/news/2017/03/01/poland-asylum-seekers-blocked-border. Their findings confirmed that the Polish Border Guard arbitrarily refused to admit a number of persons asking for asylum in Poland, with only a couple of individuals (2-3 families) per day being admitted to the asylum procedure. The logic behind the registration of asylum cases by the Polish Border Guard seemed unclear. Those refused entry were asked to board a return train to Belarus later the same day and received a decision where the Border Guard officers marked the reason for refusal: ‘Lack of entry visa’. The scale of forced migration to Poland, most of which occurs at the country’s eastern border, is relatively small as compared to the movements in the south of Europe, with the number of asylum applicants not exceeding 16,000 per year in the last 20 years.3All statistical data and information come from the official websites of the Polish Office for Foreigners and the Polish Border Guard. Most importantly, forced migration to Poland is characterized by its transit character. The majority of applicants move on to other EU countries (in particular to Germany and Austria) without waiting for their cases to be decided by the Polish asylum authorities. Since the early 1990s, when Poland joined the 1951 Refugee Convention, Russian nationals have represented one of the largest groups of asylum seekers in the country (up to 90 per cent of all applications in 2004-2008). In 2016, there were 8,992 Russian citizens among the total of 12,320 applicants for protection in Poland. In 2017 these numbers fell to 3,550 and 5,078 respectively. The vast majority of applicants of Russian nationality come from Chechnya where despite the official end of military operations, human rights violations and systemic use of violence against the civilian population are widespread. Poland is seen as the first ‘safe country’ on the way from the East to the West and it has granted protection to a number of Chechen refugees in the past, i.e. during and immediately after the First and Second Chechen Wars (in 1994-1996 and 1999-2009 respectively), which is why many Chechens continue to seek refuge in the country. However, the welcoming policy of the late 1990s and early 2000s has ended long since and most asylum seekers now find the once hospitable border crossing in Terespol tightly sealed. In accordance with international and EU standards, Polish law provides that an asylum seeker has a right to enter Polish territory when applying for international protection despite the lack of documents allowing entry. According to the Act on Foreigners, if a foreign national explicitly expresses an intention to seek asylum, the possibility of a refusal of entry based on the absence of a visa is excluded. The role of the Border Guard is limited to the formal registration of applications on a specially designated form. All registered application should then be passed, within 48 hours, to the Office for Foreigners, the administrative body responsible for examining the merit of the application. The research conducted in the framework of Human Rights Watch’s and NGO monitoring missions revealed that the Border Guard officers ignore asylum seekers’ intention to submit an application for asylum by ‘not hearing’ their requests for being admitted to the procedure. Refusal of entry is formally justified by the lack of a visa. Moreover, it is unclear according to what criteria officers decide to accept a selected few applications per day. The Border Guard do not produce official protocols nor do they record the initial interviews made at the border in any other way. Furthermore, the Border Guard also prevent lawyers from accessing the asylum seekers and providing them with legal support. In addition to numerous individual complaints and monitoring reports, the dramatically increased number of decisions refusing entry issued by the Border Guard at the Polish-Belarusian border in 2016 (88,268 as compared to 28,237 in 2015), indicates that non-admission of asylum seekers to the asylum procedure is a deliberate policy. The representatives of the Polish government have, on several occasions, officially commented on the situation at the border. They admit that Poland has restricted the access of asylum seekers to the territory, framing this new policy as a legitimate approach to the question of immigration and a departure from the ‘harmful open door policy’ pursued by the EU and the former Polish government, now in opposition.4Tok.fm (2016) Błaszczak o Czeczenach na granicy w Terespolu: testowano otworzenie szlaku napływu muzułmańskich emigrantów do Europy. Nieskutecznie. Interview with Polish Minister of the Interior and Administration Mariusz Blaszczak of 1 September 2016, http://www.tokfm.pl/Tokfm/1,103454,20629694,blaszczak-o-czeczenach-na-granicy-w-terespolu-dwa-dni-temu.html; TVN24 (2016) Czeczeni koczowali na granicy. Szef MSWiA: rząd PiS nie narazi Polski na zagrożenie terrorystyczne. Interview with Polish Minister of the Interior and Administration Mariusz Blaszczak of 31 August 2016, http://www.tvn24.pl/wiadomosci-z-kraju,3/szef-mswia-mariusz-blaszczak-o-czeczenach-na-polskiej-granicy,672450.html. The Minister of the Interior and Administration has stated that he would not allow for the formation of a ‘new Muslim migration route’ through Polish territory since it would expose Poland to the threat of terrorism. The Minister referred to the fact that, as the war in Chechnya has ended, its inhabitants should no longer be considered ‘genuine refugees,’ thereby connecting the legitimacy of protection claims not with persecution, but only with an ongoing military conflict in the country of origin. Finally, the Polish officials also argued that Poland has already been ‘doing enough’ in terms of its humanitarian commitments. When speaking in the European parliament in January 2016, the Polish Prime Minister said that Poland has accepted ‘1 million Ukrainian refugees’ and this should also be counted as an answer to Europe’s migration problem.5Polish Prime Minister’s address to the EU Parliament of 19 January 2016, http://www.europarl.europa.eu/sides/getDoc.do?pubRef=-//EP//TEXT+CRE+20160119+ITEM-010+DOC+XML+V0//PL. This confusion of the terms ‘refugee’ and ‘migrant’ falsely presented the numerous Ukrainian economic migrants in Poland as ‘refugees’ while the actual number of Ukrainians granted international protection in Poland remains at a very low level. Multiple attempts have been undertaken to challenge the situation at the border in the framework of the existing legal regime. The Minsk-based NGO Human Constanta established a local mission in Brest to monitor the situation and provide legal and humanitarian aid. Polish and Belarusian human rights workers and volunteers offered support to Chechen families by accompanying them on their train, preparing documentation of their pre-flight experience in Chechnya (including medical reports confirming beatings or torture, summons to reports to law enforcement institutions, etc.) to be handed to the Border Guard officers and writing appeals against the decisions on refusal of entry. These efforts helped many asylum seekers to be admitted to Poland, in particular if they were victims of torture and other vulnerable cases. However, on a general level, the Border Guard’s practice remained unchanged. In March 2017, asylum seekers were supported also by a group of advocates from the District Bar Council in Warsaw. As part of the ‘Attorneys at the Border’ initiative, 14 attorneys arrived at the border crossing in Terespol to provide legal assistance to persons seeking asylum in Poland with written authorization to represent them during the procedure at the border. The attorneys were refused the possibility to meet their clients: they were not let inside the border station premises where the asylum seekers were interviewed by the Border Guard officers. The asylum seekers were all denied the possibility to lodge an application and received administrative decisions on refusal of entry. The advocates continued to represent their clients by challenging the decisions in an appeal administrative procedure before the Border Guard Headquarters and later bringing several cases before the Voivodship Administrative Court. In total, in 2017, 34 complaints against the Border Guard concerning cases of non-admission of asylum seekers to Poland were registered by the Court, which includes the cases of March 2017. While about one third of them were dismissed or rejected, and another third are still pending (as of February 2018), in 11 cases the Court overruled the Border Guard Headquarters’ decision on refusal of entry to Poland. At the time of writing, in two judgments, the Court held that a memo written by a Border Guard officer indicating ‘economic purposes’ as the reason behind a foreigner’s intent to enter Poland cannot be a sufficient evidence on the basis of which the entry is denied and that a formal protocol needs to be prepared and signed by the foreigner. One of those cases has reached the Supreme Administrative Court which upheld the decision of the lower instance.6Information provided by WSA judge Ewa Marcinkowska, cited in: TVN24, Straż Graniczna staje przed sądem. Za odmowy uchodźcom wjazdu do Polski, 5 February 2018, https://www.tvn24.pl/wiadomosci-z-kraju,3/straz-graniczna-przed-sadem-procesy-za-odmowy-uchodzcom-wjazdu,811669.html; Helsinki Foundation of Human Rights, Administrative court again rules in favour of foreign refugee refused entry to Poland, 27 October 2017, http://www.hfhr.pl/en/administrative-court-again-rules-in-favour-of-foreign-refugee-refused-entry-to-poland/ ; Helsinki Foundation for Human Rights, WSA uwzględnił skargę na decyzję o odmowie wjazdu do Polski uchodźczyni z Czeczenii, 2 June 2017, http://www.hfhr.pl/wsa-uwzglednil-skarge-na-decyzje-o-odmowie-wjazdu-do-polski-uchodzczyni-z-czeczenii/; Supreme Administrative Court, Judgment IV SA/Wa 3021/16 , 17 May, http://orzeczenia.nsa.gov.pl/doc/6BDCAC62A3. Cases of non-admission to the asylum procedure in Poland were also subject to litigation on an international level. In 2017, the European Court of Human Rights (ECtHR) communicated to the Polish Government four cases concerning access to asylum of Chechen and Syrian nationals submitted on their behalf by Polish and Belarusian lawyers.7European Court of Human Rights, Press country profile – Poland, January 2018, http://www.echr.coe.int/Documents/CP_Poland_ENG.pdf; Helsinki Foundation for Human Rights, ETPC zakomunikował polskiemu rządowi skargi dotyczące odmowy wjazdu uchodźcom w Terespolu, 18 August 2017, http://www.hfhr.pl/etpc-zakomunikowal-polskiemu-rzadowi-skargi-dotyczace-odmowy-wjazdu-uchodzcom-w-terespolu/. All applicants had multiple times tried to lodge an asylum application at the border but were denied entry to the country and sent back to Belarus without the asylum procedure being instigated. In several cases, the ECtHR, under Rule 39 of its Rules of Court, had issued interim measures ordering the Polish government not to remove the applicants to Belarus, however the authorities failed to comply with the order. The applicants argue that their situation was not reviewed individually and was part of the policy adopted by the authorities aimed at reducing the number of asylum applications registered in Poland which amounts to a violation of the prohibition of collective expulsion (Article 4 of Protocol No. 4 to the Convention). The authorities have also neglected the fact that Belarus fails to provide meaningful protection to asylum seekers, in particular from Chechnya, and cannot be considered a safe country.8Human Rights Watch, World Report 2018 – Belarus, January 2018, https://www.hrw.org/world-report/2018/country-chapters/belarus. Further allegations state that the mere necessity to repeatedly appear at the border to claim protection amounts to degrading treatment and that the applicants did not have access to an effective remedy against the decision to refuse entry. Polish courts’ decisions and the ECtHR potentially indicating a breach of European Convention for Human Rights may constitute an important step towards improving access to asylum in Poland. The issue of push-back at the eastern border seems as important for the EU’s commitments in the field of asylum as in the context of protection of the rule of law. In 2017, the European Parliament adopted a resolution on the situation of the rule of law and democracy in Poland in which, inter alia, it called the Polish government to halt summary returns to Belarus as well as to comply with the binding interim orders of the ECtHR and to ensure full access to the asylum procedure in line with international obligations and EU law.9European Parliament resolution of 15 November 2017 on the situation of the rule of law and democracy in Poland, No. 2017/2931(RSP) http://www.europarl.europa.eu/sides/getDoc.do?type=TA&language=EN&reference=P8-TA-2017-0442. However, it still remains to be seen if the Polish authorities will respect the decisions of international institutions or rather embark on path of confrontation, following the example of Hungary.10Nagy B (2017) Restricting access to asylum and contempt of courts: Illiberals at work in Hungary, http://eumigrationlawblog.eu/restricting-access-to-asylum-and-contempt-of-courts-illiberals-at-work-in-hungary/. Another troubling aspect of Poland’s restriction of access to asylum is that it seems to be very much in synch with the EU’s increasing reliance on the so-called externalization of migration politics where the responsibility for border governance, including for accepting asylum seekers, is transferred to the countries of the neighborhood. Cooperation between Belarus and the EU aimed at ‘addressing the phenomenon of increased irregular migration flows through Belarus originating from the conflict in Ukraine, the civil war in Syria and the economic crisis in Russia’ has been ongoing since 2016.11EC, Commission Implementing Decision of 20.7.2016 on the Annual Action Programme 2016 in favour of the Republic of Belarus to be financed from the general budget of the European Union https://ec.europa.eu/neighbourhood-enlargement/sites/near/files/neighbourhood/pdf/key-documents/belarus/20161027-belarus_aap-2016.pdf. This is particularly worrisome as third countries, such as Belarus, remain much worse equipped than the EU to provide meaningful protection to individuals fleeing persecution, which raises significant human rights concerns. 1. ↑ Brown J (2016) ‘Chechen asylum seekers stranded in Belarus’, Al Jazeera English, 5 October, https://www.aljazeera.com/indepth/features/2016/09/asylum-seekers-stranded-europe-dictatorship-160919191015494.html; Deutsche Welle (2016) ‘Poland slams door on Chechnyan refugees’, 31 August, http://www.dw.com/en/poland-slams-door-on-chechnyan-refugees/a-19516827; Kurczab-Redlich K., Anannikova L (2016) ‘Czeczeni na polsko-białoruskiej granicy. Ze śladami tortur, głodni, prześladowani. Dla Polski nie są uchodźcami’, Gazeta Wyborcza, 23 September, http://wyborcza.pl/1,75398,20738464,czeczeni-na-polsko-bialoruskiej-granicy-ze-sladami-tortur.html. 2. ↑ Human Constanta (2016) Invisible Refugees on Belarus Poland border; http://www.osce.org/odihr/273021?download=true; Association for Legal Intervention 2016 At the border. 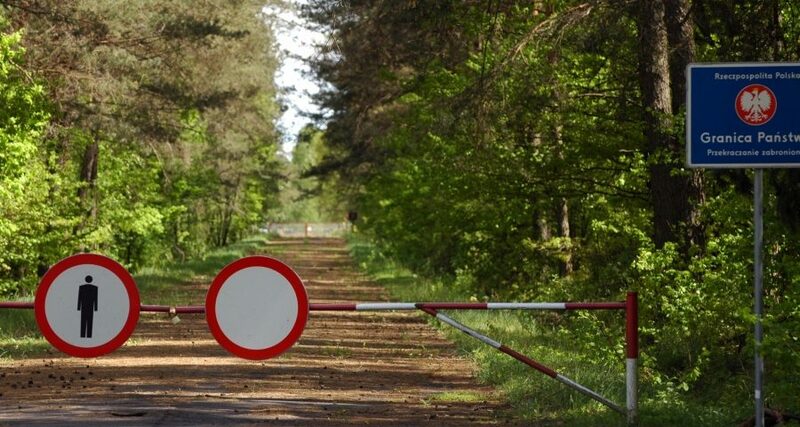 Report on monitoring of access to the procedure for granting international protection at border crossings in Terespol, Medyka, and Warszawa-Okęcie Airport http://interwencjaprawna.pl/en/files/at-the-border.pdf; Helsinki Foundation for Human Rights A road to nowhere. The account of a monitoring visit at the Brest-Terespol border crossing point http://www.hfhr.pl/wp-content/uploads/2016/11/A-road-to-nowhere.-The-account-of-a-monitoring-visit-at-the-Brze%C5%9B%C4%87-Terespol-border-crossing-point-FINAL.pdf; Commissioner for Human Rights 2016 Inspection of the railway border crossing in Terespol https://www.rpo.gov.pl/en/content/inspection-railway-border-crossing-terespol; Human Rights Watch 2017 Poland: Asylum Seekers Blocked at Border https://www.hrw.org/news/2017/03/01/poland-asylum-seekers-blocked-border. 3. ↑ All statistical data and information come from the official websites of the Polish Office for Foreigners and the Polish Border Guard. 4. ↑ Tok.fm (2016) Błaszczak o Czeczenach na granicy w Terespolu: testowano otworzenie szlaku napływu muzułmańskich emigrantów do Europy. Nieskutecznie. Interview with Polish Minister of the Interior and Administration Mariusz Blaszczak of 1 September 2016, http://www.tokfm.pl/Tokfm/1,103454,20629694,blaszczak-o-czeczenach-na-granicy-w-terespolu-dwa-dni-temu.html; TVN24 (2016) Czeczeni koczowali na granicy. Szef MSWiA: rząd PiS nie narazi Polski na zagrożenie terrorystyczne. Interview with Polish Minister of the Interior and Administration Mariusz Blaszczak of 31 August 2016, http://www.tvn24.pl/wiadomosci-z-kraju,3/szef-mswia-mariusz-blaszczak-o-czeczenach-na-polskiej-granicy,672450.html. 5. ↑ Polish Prime Minister’s address to the EU Parliament of 19 January 2016, http://www.europarl.europa.eu/sides/getDoc.do?pubRef=-//EP//TEXT+CRE+20160119+ITEM-010+DOC+XML+V0//PL. 6. ↑ Information provided by WSA judge Ewa Marcinkowska, cited in: TVN24, Straż Graniczna staje przed sądem. Za odmowy uchodźcom wjazdu do Polski, 5 February 2018, https://www.tvn24.pl/wiadomosci-z-kraju,3/straz-graniczna-przed-sadem-procesy-za-odmowy-uchodzcom-wjazdu,811669.html; Helsinki Foundation of Human Rights, Administrative court again rules in favour of foreign refugee refused entry to Poland, 27 October 2017, http://www.hfhr.pl/en/administrative-court-again-rules-in-favour-of-foreign-refugee-refused-entry-to-poland/ ; Helsinki Foundation for Human Rights, WSA uwzględnił skargę na decyzję o odmowie wjazdu do Polski uchodźczyni z Czeczenii, 2 June 2017, http://www.hfhr.pl/wsa-uwzglednil-skarge-na-decyzje-o-odmowie-wjazdu-do-polski-uchodzczyni-z-czeczenii/; Supreme Administrative Court, Judgment IV SA/Wa 3021/16 , 17 May, http://orzeczenia.nsa.gov.pl/doc/6BDCAC62A3. 7. ↑ European Court of Human Rights, Press country profile – Poland, January 2018, http://www.echr.coe.int/Documents/CP_Poland_ENG.pdf; Helsinki Foundation for Human Rights, ETPC zakomunikował polskiemu rządowi skargi dotyczące odmowy wjazdu uchodźcom w Terespolu, 18 August 2017, http://www.hfhr.pl/etpc-zakomunikowal-polskiemu-rzadowi-skargi-dotyczace-odmowy-wjazdu-uchodzcom-w-terespolu/. 8. ↑ Human Rights Watch, World Report 2018 – Belarus, January 2018, https://www.hrw.org/world-report/2018/country-chapters/belarus. 9. ↑ European Parliament resolution of 15 November 2017 on the situation of the rule of law and democracy in Poland, No. 2017/2931(RSP) http://www.europarl.europa.eu/sides/getDoc.do?type=TA&language=EN&reference=P8-TA-2017-0442. 10. ↑ Nagy B (2017) Restricting access to asylum and contempt of courts: Illiberals at work in Hungary, http://eumigrationlawblog.eu/restricting-access-to-asylum-and-contempt-of-courts-illiberals-at-work-in-hungary/. 11. ↑ EC, Commission Implementing Decision of 20.7.2016 on the Annual Action Programme 2016 in favour of the Republic of Belarus to be financed from the general budget of the European Union https://ec.europa.eu/neighbourhood-enlargement/sites/near/files/neighbourhood/pdf/key-documents/belarus/20161027-belarus_aap-2016.pdf.